It has been a few weeks since my last Mommy Moments entry and today's theme is Field Trips. 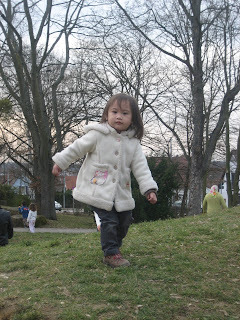 Since my daughter is not yet in preschool or kindergarten, she hasn't gone on an official field trip yet. But the family does go on field trips every trips, that is if you consider road trips a field trip. I guess when you say "field trip", it's all about learning something new about a place, about nature and the environment or animals. We have already taken Samantha to the zoo but we are planning to do it again come Spring or Summer. I am sure she will now have a better appreciation of the animals. Another trip that we are planning is to go to is in Insel Mainau because I heard that it has got very beautiful botanical and flower gardens. The photo below with the tulip fields is one of its Spring attractions. This I have got to see for myself! Yesterday, we went out for a walk around the neighborhood because it was a very nice day. 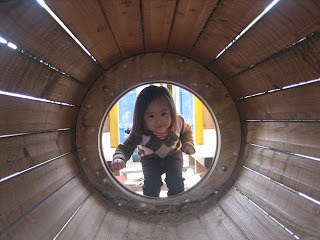 I was searching the internet for a Kindergarten near us and found one just about 500 meters from our house. It is run by the local Catholic parish so I decided that we give it a look. It was already around 330pm when we got there and it looks like it's already closed for the day. So to make the most of the warm day, we walked on and discovered the neighborhood's spielplatz (playground area) and my, was my little Sam ever so delighted with what she saw. 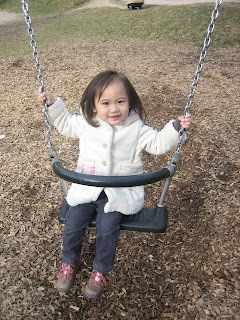 L: Trying out the swing. R: Just finished climbing a very tiny weeny hill. L: See? 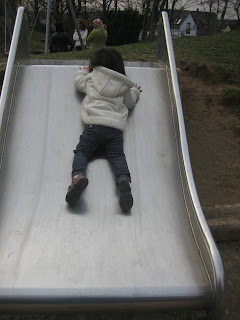 She can slide by herself! R: And look, she can even slide on her tummy. She had so much fun trying out the swing, the train, the sand box, the slides... She particularly enjoyed the slides and was able to slide by herself after a few tries with me holding her hand. 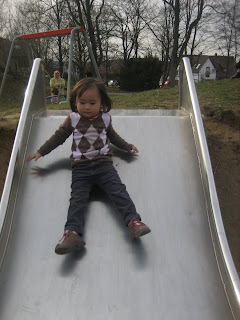 She finally built up confidence and discovered that she can go up and then slide down all by herself. I am just so proud of my little girl. Our little excursion around the neighborhood was worth it. This afternoon, we are off again to the spielplatz after Samantha has taken her nap. We will be bringing along her toy pails and shovels so that she will learn how to build sand castles. I am sure she will have another discovery today. How about you Mommy? What's your field trip experience? Come share it with us! Me, too. I really wanna see a tulip garden by myself. It's true, any trip where you learn something new is a field trip because the main objective of setting a field trip is to explore something new in order to learn. Family trips achieve that goal so it doesn't make any difference whether it's school or family arranged trips. Both achieve the end goal. That was a really fun day for Sam, mommy! Oh, you have a new layout. I love it! My Mommy Moments entry is up, too. she sure was having fun!